Vizag Also known as Viśākhapaanamu, shortened and anglicized: Vizag or Vizagapatnam or waltair is a port city located in Coastal Andhra Pradesh. It is located on the eastern shore of India, nestled among the hills of the Eastern Ghats and facing the Bay of Bengal to the east. The land of the golden beaches was just over half a century ago a small fishing village. One would be amazed at the manner in which this port city with a natural harbour developed into one of the fastest growing cities in Asia.The city is about 650km northeast of Hyderabad and is also the administrative headquarters of Visakhapatnam District. It is also the headquarters of the Eastern Naval Command of the Indian Navy. Also known as the mostly defunct colonial British name, Waltair. During the colonial era, the city had at its hub the Waltair railway station, and that part of the city still goes by the name of Waltair. It is also popularly referred to as "Vizag", a shortening of its full name. It is sometimes also referred to as the "City of Destiny"
The city is home to several state owned heavy industries, and has one of the country's largest ports and its oldest shipyard. It has the only natural harbour on the eastern coast of India. Vizag is primarily an industrial city, apart from being a tourist destination. Tourists are attracted by its unspoilt beaches, nearby scenic Araku Valley and Borra (Boralu) caves, the 11th-century Simhachalam temple and ancient Buddhist sites spread across the area. The city boasts a submarine museum, the first of its kind in Southeast Asia, at Rama Krishna Beach. This region, formerly part of the great Kalinga empire that stretched up to the river Godavari, has also been mentioned in Hindu and Buddhist texts from the 5th and 6th centuries BCE, as well as by Sanskrit grammarians Panini and Katyayana in the 4th century BCE. This city was ruled by several dynasties: the Kalingas during the 7th century, the Chalukyas during the8th century, the Cholas, the Qutb Shahis of Golconda, the Mughal Empire and the Nizams of Hyderabad. Vast stretches of beaches right next to the city on one side and undulating green hills on the other have made Vizag, as it is endearingly called, a tourist haven. An ideal destination, it caters to the religiousminded, the Buddhist pilgrim, the fun-lovers and adventure-seekers. A number of beaches and a long stretch of road along the sea-shore up to Bheemunipatnam town, the second oldest municipality in the country, are a pleasure to experience. No trip to Vizag is complete without a sojourn at Araku, 110 km away, a lovely valley nestled amidst the high Eastern Ghats. Simhachalam temple, Rishikonda beach, the Dolphin's Nose hillock projecting into the sea enchantment unlimited - that is Visakhapatnam. Local legend says that an Andhra king (9-11th century) on his way to Benares rested there. So enchanted was he with the sheer beauty of the place that he ordered a temple to be built in honour of his family deity, Visakha. Archaeological sources, however, reveal that the temple was possibly built between the 11th and 12th centuries by the Chola king, Kulottunga Chola I. A shipping merchant, Sankarayya Chetty, built one of the mandapams, or pillared halls, of the temple. Although it no longer exists (it may have been washed away about a hundred years ago by a cyclonic storm), elderly residents of Vizag talk of visits to the ancient shrine by their grandparents. Noted author Ganapatiraju Atchutarama Raju contradicted this . In the 18th century, Visakhapatnam was part of the Northern Circars, a region of Coastal Andhra that came first under French control and later that of the British. Visakhapatnam became a district in the Madras Presidency of British India. After India's independence it was the biggest district in the country and was subsequently divided into the three districts of Srikakulam, Vijayanagaram and Visakhapatnam. Its traditional importance in ship-building is confirmed by the fact that India's first ship, the "Jala Usha", was launched in Vizag. Vizag is also one of India's main fishing ports, has a dedicated harbour for the fishing industry and handles a large percentage of India's seafood exports. Connected with Hyderabad, Chennai, Kolkata, New Delhi and Bhubaneshwar. Indian Airlines flies daily to Hyderabad and five times a week to Chennai, New. Delhi and Kolkata. Visakhapatnam is a major junction on the commercially important ChennaiKolkata rail line. As such the city is well connected by rail with New Delhi, Chennai, Kolkata and Hyderabad. Daily express trains are available to all these four maj or cities. Visakhapatnam is 650 km from Hyderabad and 350 km from Vijayawada. Regular bus services are available to Hyderabad, \Tijayawada, Bhubaneswar, Chennai and Tirupati. In the same district of Visakhapatnam, 16 kms along the picturesque Vizag-Bhimili road lies Thotlakonda, where a number of stupas, viharas and chaityas belonging to the Hinayana school were found. A unique discovery providing evidence of maritime trade during that period was Satavahana coins bearing on the obverse of a ship with two masts, anchored to the shore. The site can be approached via the road running along the coastline between Visakhapatnam city and Bheemunipatnam (Bhimili), the second oldest municipality in the country. The historical town is set on the confluence or river Gosthani and Bay of Bengal. One can see temple dedicated to Lord Narasimha atop a big laterite hill. According to a legend Bhima one of five pandava brothers of Mahabharta epic killed demon bakasura and installed this shrine. It is also known for the 17th century ruins of a Dutch fort and settlement. A cemetery here has some tombs, embossed with the skull-and-cross bones motif of the sea pirates. The beach here is quite calm and considered to be the safest for the Swimmers. A drive on the beach road from Visakhapatnam to Bheemunipatnam is quite fascinating, the 24 km. long beach road is said to be the second longest in the country. The spectacular falls adjoining the river Machkund are set amidst scenic surroundings. These are the highest falls of the region and are visited by many tourist. It is about 48 kms. from Visakhapatnam and has a rich variety o avifauna species. Simhachalam or the 'Lion's Hill' is 16 km from Visakhapatnam. it is an important Hindu Pilgrim Center, known for the Varaha Lakshmi Narasimhaswami Temple. The 11th century temple is amongst the most important shrines or Lord Vishnu in the country. THe presiding deity of the shrine is Lord Narasimha - a combination of the varaha and the Narasimha incarnations of Vishnu. The main deity is always covered with sandal paste and the real shape of the deity can only be seen during Chandanayatra Festival' (March-April). The Shrine is also noted for its excellent architecture. It is about 75 kms from Visakhapatnam on the Aruku road and had camping facilities at jungle Bells, which provides an enchanting experience to the tourists. The region is rich in flora nd fauna. The main attractions are rock climbing,trekking and target shooting with bow and arrows, Even the language of the jungle is taught like identification of calls, marks etc. as well as understanding interesting features of various flora and fauna o prevalent in the Eastern Ghats, It is a very unique experience to stay in the log huts and tents set in tribal environs. The charming hill on the seafront, sprawled over 100 acres of hill area, and rising 304 mts. above sea level, presents a breath taking scenic view, especially towards Bheemili. It has been developed as an attractive picnic spot. View points with roof and cement seats are located at different places on the hill to enjoy the serene atmosphere and scenic beauty and the whole city can be viewed in a panorama through seven vantage points on this location. The magnificent Shiv Parvathi statues with lighted mountains in front are worth seeing. Sankaram, Chakram and Namam fully lighted in the night are visible from almost all parts of the city. DOLPHIN'S NOSE The most conspicuous landmark in Vizag is Dolphin's Nose, a huge rock 357 mt hight promontory jutting out into the sea and very like the nose of the mammal. It also shelters the harbour, from where manganese and iron ore are shipped out. The nation's powerful beacon of the lighthouse directs ships 65 kms away. Down the coast towards Bhimili is Rushikonda Hill ("the Sugarloaf Hill") and beach. The beach is ideal for surfing and swimming. Rushikonda is a thickly covered hill located at a distance of 13kms. from Visakhapatnam on the Visakhapatnam- Bheemunipatnam beach road. The steep hill slopes upward from Rishikonda beach which is one of Visakhapatnam's loveliest beaches. Golden, unspoiled sands quenched by the sun-drenched waters of a tranquil sea, a well appointed 36 room tourist lodge, individual rental cottages, a restaurant and other amenities in the tourist complex, make Rishikonda even more inviting. A trip to Indira Gandhi Zoo Park is never boring which considered as of the India's largest in-door Zoo park of its kind. Located near Bay of Bengal and surrounded by Visakha Vally, this zoo park features a cast of thousands! Their stars includes the Cat Complex where you can see the entire cat family with Lions, Bengal tigers, Jaguars, Leopards etc. A Special Mini-Train was installed at the Indira Priyadarshini Zoological Park to facilitate people to watch the wild life in a open top train which runs of rubber wheels. Nearly eighty species numbering eight hundred animals are present in the zoo. The well planned layout of the zoo has different sections for primates, carnivores, lesser carnivores, small mammals, ungulates and birds. The Birds encloser includes all kinds of birds and peacocks. There is a Deer Safari available for the visitors. The zoo is open all the days except Mondays. The primates comprise various monkeys - the common Langur, Rhesus monkey, Bonnet Monkey and also includes certain other exotic fauna like Mandrills, Olive Baboons and Sacred Baboons. The Himalayan Black bear and the Sloth bear in the bear complex are housed in large moated enclosures. The Hippopotamus is a special attraction to the zoo. The Crocodile complex has all the three Indian Crocodile species. The Reptile section has Pythons, Snakes, Land Tortoises, Terrapins, Water Monitor Lizards, Monitor Lizards etc. Elephant, Bison, Sambar, Spotted Deer, Nilgai, Barking Deer and Thamin Deer are the collection in Herbivores section. A varied collection of birds from the Eastern ghats in the large walk-through aviaries is a special attraction in the Zoo. Grey Pelicans, Rosy Pelicans, Pied Horn bills, Painted Storks, Peacocks, Ducks, other ground birds and little beautiful love birds, Budgerigars, and Cockateels form the bird collection in the Zoo. Vuda Park, also known as Taraka Rama Park, is one of the prime attractions in Visakhapatnam. It is a beautiful park right on the Sun-n-Sea beach with boating and swimming facilities, roller skating rink (Consult the master for training 9 a.m. to 8.p.m) , artificial caves, beautiful long lawns, flower gardens, and a children's park. Playpen for children - 40 Children can play at a time with 3000 plastic balls and with boxing bags. (Free). One of the main attractions of the park is the Musical Fountain with a huge gallery to rest and take in the beauty. (at 6.30 p.m. Rs.5/-). Vaisakha Kala Vedika Trust (Free) (conducts classical music & dance everyday in the evening from 6 p.m.) Every evening cultural programs such as classical music, dance, and poetry are conducted at the Visakhi Kalavedika open auditorium. For those who go for picnicing, there are a variety of restaurants and food stalls. Mudsarlova Park is located at a distance 5 km. from Vishakhapatnam, at the vicinity of Lake surrounded by hills and Palm Trees. The site consists of park, several picinig spots, wide lawns, fountains, beautiful flower gardens, different types of trees. birds and peacocks in cages. One of the main attraction of this park is scenic Golf Course Club. Appikonda is a small village located 18-kms from Visakhapatnam at the cost of the Bay of Bengal. History speaks that it is at this village that Kapila Maha Muni has installed the idol of Somalingeswara Swamy and thus the name - Kapilakonda which was over the ages changed to Apillakonda and further to Appikonda. The Lord Shiva temple here contains inscriptions dating back to 12th Century AD. There was a life-size bull at the temple that was carved out of Black Stone. Every years Shiva Rathri is celebrated with much devotion. SRI VENKATESWARA SWAMY KONDA The important hillock of ht city has temple dedicated to Lord Venkateswara, According to the Telugu inscriptions, a british soldier Captain Black moor built, this temple in 1886. From here one can view the port channel, which was the entrance of the inner harbour for ships and liners. This magnificent hill has a mosque and a shrine dedicated to the Muslim saint sayed Ali Medina Alias ishaque Madina, who revered for his prophecies, The shrine is visited by people of all faiths. The magnificent beach sprawls over the largest part of the sea front and is the most popular site i the city. The Ramakrishna mission is located nearby and there is also and imposing KALI TEMPLE near the beach. The aquarium here is an another attraction of the beach. Plans are on to upgrade this into an Oceanarium. This popular beach is located to the north of Visakhaptnam and is considered Ideal for Swimming and surfing as well. The beach has changing rooms and facilities for fresh water bathing after a swim in the sea. This fine beach resort has been developed by Visakhapatnam Urban Development Authority (VUDA) on the splendid Visakhapatnam - Bheemunipatnam beach road. The resort has a rustic ambience with landscape gardens and coconut grooves a restaurant and amphitheater. Day 1 :Start from Kolkata preferably by 2863 Yesvanthpuram Exp (next alternative 2841, Coromondal Express), departing at 20:35 from Howrah and arriving Vizag at 10.40 next day. Day 2 :Stay at Vizag -Explore local area including Ramakrishna Beach, Rishikonda Beach etc. Day 3 :Stay at Vizag -Trip to Kailashgiri, Simachalam, Bheemunipatnam, Indira Gandhi Zoological Park, VUDA Park, INS Kurusura Submarine, Dolphin's Nose etc. Nirala Saikate is situated at a very prime location in Vizag city at R K Beach beside Kali Temple and N.T.Rama Rao statue. Raut Bari or the Dooars Nest is located just opposite Murti River the Gorumara National Forest, the heart of Village Murti with a close proximity to Chapramari Wildlife Sanctuary and Gorumara National Park. A budget hotel with all basic amenities and homely atmosphere operated by Mr. Parimal Routh, the oldest private hotel operator at Murti area besides the WBFDC Run Banani. Tuskers Den , an eco village resort in South Indong Forest , Garumara is one of the premium Resort in the entire Dooars area Bejeweled by a bunch of spectacular features. Only 15 Km from New Mal Junction, The Tuskers Den is standing with awesome majesty with an area of 5 Acers, emanating the effulgence of sophistication. At the first view from outside, it appears that prolific effusion of rampant romanticism and artistic strokes of brush have synergistically drawn the silhouette of the village resort on the canvas of green lush North Indong forest. River Murti is just one km from the resort. Super Deluxe Doubles Room - Rs.1900/- + 10 % Service Charges. 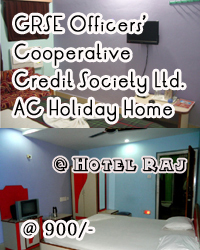 Deluxe Double Room - Rs.1700/- + 10 % Service Charges. Extra Mattress - Rs.500/-+10% Service charges. Located at Dhupjhora , Murti, the joy of staying at Aranyak The Ca-Cur-Badi Forest Resort is as unbound the nature abounding it. The tours, both guided and unguided, include bird watching, a nocturnal encounters, a primary tour of the Forest, as well walk along the river Murti. In addition, the resort offers tours outside the resort where guests can learn about some of the native cultures of Dooars. Some of other activities of Ca-Cur-Badi Resort includes special bonhomie with Bar be Que, dance and cultural performance by local ethnic tribes. The ambience of Ca-Cur-Badi Resort is just as much picture perfect as in demand by the corporates for business meet away from the cities they are located. Be it a holiday or an exclusive honeymoon or a business trip, Hotel Prime Murti provides accommodation with the modern necessities required for complete comfort. Hotel Prime Murti is well placed at Uttardhupjhora, Murti. Bagdogra Airport is 80 km whereas New Jalpaiguri Railway Station is 70 km from the property.